Yesterday I shot part of a photo story I want to do, it ties in to the food photos I posted the other day. Anyways, without giving too much away, here is a sneak peek at the story. 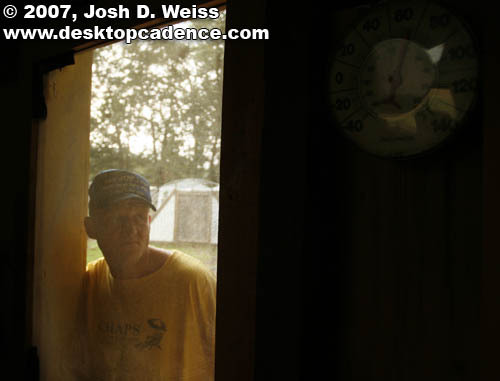 Paul Vinson, a hand at Mills Farm in Athens, Ga., looks through a screen door into the mill where the farm’s “Red Mule Grits” brand are ground. Mills Farm is one of many locally owned and operated small farms around the Athens area. Posted in News, Red & BlackTagged athens, georgia, mills farmBookmark the permalink. I am psyched about seeing this story. Nice image here.